Keep your work site safe, minimise downtime and increase productivity by including Vibration Monitoring as a part of your environmental management plan! Vibration Monitoring is a core component of condition monitoring for any and all heavy machinery used in commercial and industrial environments. Heavy machinery used in commercial and industrial environments must go through routine testing to identify any major issues. Condition monitoring is a major aspect of predictive maintenance and involves measuring aspects such as vibrations. The process ensures safe operation of heavy machinery. SERS have eight mobile vibration monitoring systems available to deliver detailed vibration analysis for your worksite. Our specialist Environmental Consultants can install complete systems, provide servicing to our equipment at no additional charge, and install remote data systems to gather real-time alerts and warnings. 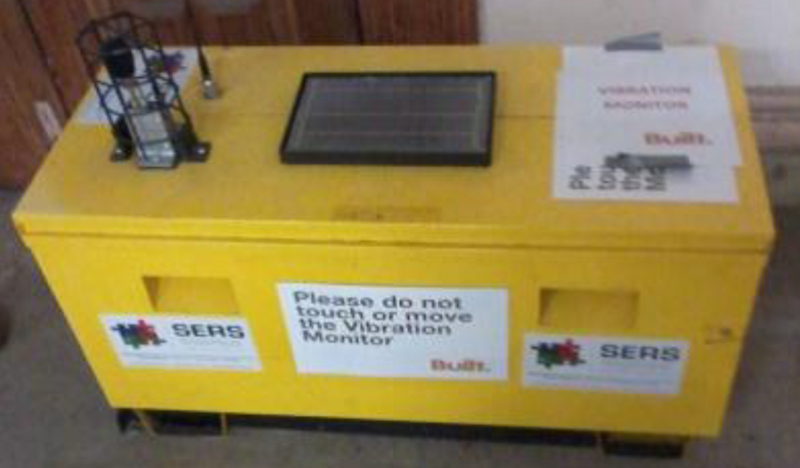 Contact SERS today for your vibration monitoring services. Machinery that is not monitored on a regular basis is more likely to lead to failure. Vibration monitoring services are typically used for rotating equipment such as pumps, electrical motors, and combustion engines. Visual inspections are often not sufficient to perform such tests as advanced equipment is needed for a complete analysis. Vibration monitoring can identify problematic machine faults including misalignment and looseness. A periodic monitoring program assesses the vibration levels over time, giving a more detailed overview at the equipment. It also enables a more accurate assessment of any faults present in the equipment. Vibration monitoring programs are strongly recommended as a precaution to minimise downtime and prevent unexpected failures. This is accomplished through scheduled maintenance leading to early detection. SERS has extensive experience with providing solutions for a range of machines across different industries. SERS offers a range of vibration monitoring services that are tailored to meet client specifications and regulatory standards. We have eight mobile vibration monitoring systems available to deliver detailed vibration analysis for commercial and industrial environments. Our available mobile units do not require access to mains power as each is completely self-sufficient. Each unit is equipped with remote telecommunication systems and serviced by our team of specialists. Servicing of our equipment is completed in our in-house facilities at no extra charge. Our services are incredibly flexible with staff readily available to support clients as needed. Our services are available within the CBD district of Perth, Brisbane, Sydney and Darwin, regional areas of Western Australia, Queensland, and the Northern Territory. Our clients include private developers and a number of ASX 200 listed companies. We offer complete coordination between the data and consultancy services under one stream. Vibration analysis is one of the most commonly used methods to gather detailed measurements. Vibration levels are then measured against historical baseline values to detect any anomalies and to assess severity. Interpreting the signals is an elaborate process that requires specialised experience. At SERS, we use state of the art technologies for data procurement and analysis. Examining individual frequencies is a common technique in vibration analysis which can often be used to identify the root cause of any mechanical problems. Examples may include increased signals at specific frequencies. Comprehensive vibration analysis can be used to detect equipment wear before failure occurs. This gives ample time to schedule maintenance or repair, minimising costly downtime as much as possible. Frequency analysis is only one aspect of evaluating vibrations. SERS applies a number of techniques and specialised equipment for detailed assessments. Our professionals consider numerous aspects, from the historical trends of vibrations to bearing temperatures and more. Our analysts examine the data for any changes that may indicate an impending failure with the equipment. Larger machines typically employ permanent monitoring systems rather than the use of a handheld device.